I’m not sure if everyone feels like this, I suspect not, but the frustrating thing about being me is that even after having successfully done something multiple times, I still don’t feel confident that I could do it again. For example, a couple of years ago, I did a project for the Brisbane Writer’s Festival where I scored something like 50 music cues for a set of real-world choose your own adventure journeys. I was just listening back to those cues earlier today, and they’re not Hans Zimmer*, but they worked. It was successful. Listening back to old works – or the successful ones – I’m always rather surprised that I actually did that thing, and am always vaguely anxious because I don’t feel confident that I could do it again, even though that logically makes no sense at all. For example, with the StreetReads stuff, that was really my first time using Logic, and yet I worked it out, and cranked out plenty of solid music cues. So having that experience should mean I’d be able to do the same thing at least as well a second time around, if not even better, right? Unfortunately that’s not the way my unconscious thinking interprets the event. My lovely, miraculous brain, sees it more like a fight for survival that I successful overcame, probably more by luck than skill, and that it is a situation to be avoided in the future if at all possible. Which in a strange way makes sense, because it was scary and a bit of a leap in the deep end for me at the time. Unfortunately, I think I felt more confident about doing the task before than I do now that it’s over! I wonder if other people have this reaction? Ultimately the response is pretty meaningless and just the way certain parts of my thinking interpret my experience, and it doesn’t concern me overly, I’ll stilt show up and do my best each time, but I do wonder if it’s like this for others? It seems like for some people, with each success they feel a sense of confidence. “I did it once, so I can do it again!” And that makes sense, and so with each new success, comes a new level of confidence and assurance in one’s own abilities. But talking about my raw experience, nothing could be further from the truth. There’s an interesting analogy in the book “Bounce” by Matthew Syed. Basically, he has observed that most people see themselves as either an Christmas bauble or an orange. If you’re an orange, you’re living with the idea that you can ‘take whatever beating life throws at you’ and ‘if the going gets tough, get tougher’ etc. Because what happens when you drop an orange? Not much, it looks pretty much the same. You can drop an orange a dozen times and it’ll still look like an orange. But on the inside it’s bruised, battered and a mess. Sayed goes on to say that in reality, people should see themselves as a super ball, you know those bouncy balls that you can throw at the ground and they’ll bounce back, and the harder your throw them, the higher they’ll bounce? Expertise is at worst a myth and at best, a barrier, and unfortunately, not transferrable. In this post, I’ll focus on the latter two points and save expertise for another post. At some point, the idea of having an ‘original voice’ or saying something ‘unique’ musically buried itself into my mind. I think it was something mostly absorbed through environmental cues and the way composition is looked at in a university learning context, but there were also direct verbal reinforcements. A situation that happens all to often is that you wrote something (unintentionally) that sounds like another composer, and someone pointed it out saying ‘This sounds like x’. As a composer, that happens all the time. I’ve had people tell me I sound like everything from Benjamin Britten to Holst to Debussy to Prokofiev to Stravinsky. Quite a mixed bag that one. However, the problem is that hearing that, there has always, for me, been an implication that you aren’t being original when that happens, that you are copying, stealing, imitating etc. For me, it got to a point at one stage that I felt almost every piece had to be substantially different stylistically or I was self-plagiarising, which is just another form of being ‘unoriginal’. It was liking trying to run away from your own shadow. Through all this was this was the idea of having to have a ‘unique sound’ or voice and that if you weren’t writing truly original music you were just a hack, stealing ideas from those truly original composers. For some reason, it never occurred to me that people almost certainly told today’s pedestalled composer (from Bach to Bartok and beyond) that they sounded like other composers. We idolise these composers and talk of them as ‘great’ because, it seems to me, they are considered so unique and different and original. It implicitly seemed that unless you were writing really ‘original’ music, you were eligible to be considered at best a great orchestrator or an inventive arranger, but only a mediocre composer. This idea of the importance of originality effected me in a lot of ways, all, I’d probably say, somewhat harmful. I even found it hard to enjoy new music that sounded too similar to some other composer, because they weren’t being original. Like I said, I don’t really know where this idea came from, except through a sort of environmental osmosis. This emphasis on originality really bothered me for a while. I remember talking to one of my older composer friends during this time and him telling me very sagely that you find your voice through writing, not through thinking about it or trying to find it. It was great advice, but I could never make any use of it because as so often happens with great advice, when you’re not connected to your deeper wisdom, you can’t use it, and when you are, you don’t need it. I also couldn’t see at the time that this was a finger pointing inwards, not pointing forwards. It seemed to me that it meant just keep writing and over time, you’ll stumble upon something unqiue combination of elements (who decides this I’m not sure) and then you can continue forwards from there. Really, it was saying keep connecting with your inner musical instinct, and let it lead you. I can see why I would think this, because when we talk about composers and their writing, we talk about the unique aspects of their music and the way we talk about those make them seem like external attributes, things the composers consciously and deliberately used as foundations for their uniqueness. When we talk about Steve Reich, we talk about minimalism and phasing, looping, rhythmic cells etc as though they began life as conscious conceptual constructs and then became music. And this is the age old question – and lie in my opinion – that arises in every music theory class at some point. The theory teacher, of course, wants to make musical theory sound important, and at the same time, to narrow the (rather large, in my opinion) gap between the world of music theory and composition. This is a lie as far as I’m concerned, or at least, a misrepresentation. Did Beethoven know all of the ‘theory’ used in his music? Of course, I’m not suggesting that he wouldn’t be able to tell you what a secondary dominant is or where they lead etc. The lie, in my opinion, is which comes first in the mind, the music or the theory? I would bet my sadly small bank balance that for the majority of composers that are not employing a system in their writing, that the music comes first, and the theory links it to notation. So while the music theory student is probably trying to express their frustration at the boredom of the class, they’re also quite innocently correct too. The theory is not the music. The theory is an expedited way of understanding the music arising in the mind and distilling it into a transmittable form. In honesty, I would say composing is much more closely linked to Aural skills than to theory skills. In seeking originality we set limits on ourselves. Enormous limits. We can no longer write things we’d love to write because perhaps it’ll have similarities to something else and people will think we’re just a hack stealing from the greats. 1. The voice is an inherent part of who we are, which means it is natural and will change as we do, over time. It also means it’s not worth thinking about, just as there isn’t any point thinking about the colour of your eyes. You can wear coloured lenses if you want, but underneath your eyes are still the colour they are. 2. The voice is a developed attribute and something you have to ‘find’ or create. But if it’s outside of you, if it’s manufactured, is it your voice or just something you’ve picked up or strapped together with duct-tape? In fact, the problem with even talking about a compositional voice is that, fundamentally, the implication is that what you are isn’t enough. There’s a great quote I heard that seems relevant but can’t remember properly so I’ll try and paraphrase it: When you first start making art, it always seems bad, because your ability isn’t the equal to your taste. The problem isn’t with your inherent artistic ability, but with the transient state of not yet being able to realise your art. And I think the idea is totally relevant and applicable to composing. If we discourage or allow students to be discouraged from sounding too similar to music they love, we stop that love from being part of the music they make. I think a lot of this stems from a teacher’s earnest desire to help speed a student’s progress (or the student’s similar desire to reach musical maturity) but perhaps the time spent in ‘immaturity’ or in ‘unoriginality’ is just as important as the final destination. Better yet, perhaps we all think it’s way more important than it actually is. Are we perhaps better off inspiring a fun, free and joyful relationship to music and forgetting about the destination? The criteria we invent to determine what makes a successful composer are bogus. If you’re writing music you love, then you’re a supremely successful composer, so cut yourself a break break and share your love with the world! So today, I’m planning on taking a candid look at what goes on in the mind of a composer, or at least, this composer. The intention here is not to write an open invitation to the pity-party of the year (unless you have a spare case of red wine you want to share…), nor is it meant to be self-deprecating. It is simply a look at another part of what it means to be a human being, and specifically an aspiring composer. We’ve all heard the old quote, but the real question is what are you thinking, and what are you am-ing, or more correctly, what are you being? Psychologists have known for some time now that when, for example, a professional athlete competes, they do so not just against their opponent but against their own mind. The tennis player must not just beat his opponent but his own thinking as well. There are several books written about this and its relevance to musicians, including Kenny Werner’s Effortless Mastery and Barry Green’s The Inner Game Of Music. You might have specific technical thoughts about what writing good music means For example, perhaps you feel vaguely paranoid that you aren’t using correct voice leading or have parallels etc. You might worry about being criticised for being too romantic or too simple or too avant-garde or too whatever. Why is person X having so much success? It’s not fair. I wish they would commission me. I wish more people liked my work. Etc.I’ve had thoughts like the above at various times. To be totally honest, pursuing a career as a composer has been a challenging journey filled with roadblocks and rejection and plenty of depressing moments. I’ve often found myself wishing for a life-raft to keep from drowning in what feels like a sea of indifference. That’s the less fun side of being a composer. You believe the thoughts are true. You desperately try and fix your situation. You try and find commissions or win a competition feeling that if you could just manage that, everything would be okay. You desperately try to fix your composing, thinking that if you could just learn how the successful composers do it, you would be successful too. Unfortunately, fixing your composing normally means learning to be less true to yourself. You assume a victim mentality. It’s the world’s fault or it’s Tony Abbot’s fault. Etc. Regardless of how many seemingly valid reasons you can point to, at the end of the day, it’s not going to help you compose. You give up.The question is, which ones of these are actually helpful and healthy long term? In my mind, the pray to God option is probably the only remotely healthy option on the list, however, whether it is helpful I wont comment on and leave up to the individual to decide. I’ll share here a few of the sentiments that really helped me and will hopefully help other people too. 1. There is nothing for you to learn, remember, practice, or do. You simply need to see that our thinking is not real, and that the nature of thought is to flow and change. Consider this. Have you ever had a moment where your entire experience of how your day was going suddenly went from good to bad? Perhaps you had a nice morning at work, and then at lunch time, suddenly a thought occurred to you: Did I turn the gas off?! Immediately you feel tense and anxious. But what has actually changed since you left home in the morning? The gas is either still turned on or still turned off, either way it hasn’t changed. The only thing that has changed was that you had the thought ‘Did I turn the gas off? !’ And that thought changed your entire experience of reality in the blink of the eye. While you might think that leaving the gas on is good reason for concern and mild panic, that’s not the point. Reality didn’t change, but your thoughts changed and so your experience completely changed. This is how our thinking works. As our thinking changes, so too does our experience. All the time. Even when we aren’t aware of our thinking. While we often realise that some thoughts aren’t important or worth paying attention to, there are others that trip us up. The more importance we attach to something, the more thoughts about that thing can mess with us. For example, if you’re 6’6″ tall and someone calls you “Shorty” there is no way you’re going to be upset by it. You’ll either think it’s a joke and laugh, or if the person is serious, think that they’ve forgotten to take their meds. You’re not short, so that statement doesn’t make sense. But if you are ‘short’, you may be offended by the comment. The question is, why? Let’s use a slightly different example. We have two 5’8 men. One comes from a family of tall men, and feels 5’8 is short for a man. The other comes from a family where everyone else in his family is much shorter than he is. Do you think both of our men of identical height will be equally offended by being called ‘shorty’? Why not? Because when you get right down to it, we don’t view reality with a video camera, like many think, but with a paint brush. The reality we experience is drawn upon our consciousness with a our own individual interpretive style. Some paint things with sharper edges and muted colours, others paintmore impressionistically, and still other paint their reality with a Surrealist’s flare. 2. Negative feelings are indicators of bad thinking. If you feel bad about something, it’s because you’ve been caught up in your thinking, not because there is something actually going wrong with the world. Your emotions are to your think what pain is to your body. Pain, both physical and emotional is a warning signal to proceed with caution. There are, however, situations in which we all think feeling bad is appropriate. Next time you notice yourself feeling dispondent or upset or annoyed try asking yourself what has changed to make you feel that way. I don’t mean if you feel annoyed at your husband, to think about how he forgot to buy you flowers for your anniversary, but rather to think about how your experience changed so quickly before finding out you weren’t getting flowers, and afterwards. In both cases, you don’t have flowers, but in one situation you think it’s okay to not have flowers, and in the other case, it’s not okay. The difference is nought but a thought. And for example if you’re composing and notice you start feeling frustrated, ask what has changed between being frustrated and not frustrated. Perhaps it’s because you’ve been sitting there for an hour and haven’t written anything yet. But an hour ago, it was fine that there wasn’t anything written, and now an hour later you feel frustrated because there is still nothing written. The only difference is that in one situation you think it’s okay, and in the other you don’t. You are essentially making yourself feel miserable because you think there is a reason you should. 3. You don’t really need to do anything about your thinking. Despite a lot of what psychology says, you really don’t need to try to change or control your thinking. (If you have a mental illness, speak to your therapist. This isn’t intended as medical advice). Then there isn’t really anything you need too do, except wait for a new thought to come along. 4. The Kindness of the Design. If you cut your finger, it heals itself. You don’t actively go about healing it. You don’t clot the blood, nor do you grow the new skin. Even in the worst cases, medicine is used not so much to heal the body, but to create the conditions in which the body is able to heal itself. The same is true of the mind. I’m not talking about the physical structure of the brain, but the psychological structure of the mind and our thinking. If you brush up against some unpleasant thinking, think of it like injuring yourself physically. Don’t poke or scratch at it too much, and try and let it heal. But even as you’re speaking together, something’s bothering you about the conversation. He’s saying all the right things, and yet something still feels out of alignment. Following your intuition, you go back and review the client intake form he filled out when he first came to you, and to your suprise you see that his name is Jesus and he’s from a small town in the Galilean region of Israel called Nazareth. What if every man, woman and child you meet has the seeds within them to become who they truly are? What if that includes you? 6. Changing the world is one of the worst ways to fix your mind. So often we resort to trying to change the world in order to change the way we think or feel. But all doing this does is reinforce the importance of your thinking. Look back up at the list of possible things one might do to deal with their thinking as it applies to composing. Most are attempts at changing the world in order to change how you feel. Unfortunately, you can change the world, but you’ll still have the same painter holding the same paint brush. 7. The answer is inside you. The answers you need will come from inside you. It’s the only place they can really come from. Not from your thinking, but from something that exists below your thinking. A deeper intelligence. A deeper wisdom. This one is harder to talk about, but sometimes the best way to get the answer you need is not to look for an expert, because you are the expert on you. So, next time you need an answer, instead of going on a fact finding mission, perhaps try just waiting patiently. Ponder it casually, in a relaxed sort of way. The answer will come in time if you’re patient. What you’re really looking for here is an Insight, and an Insight is really just a new thought. So your answer is literally one thought away. Here is the beginnings of my attempt to list the best works (IMO, of course) from the 20th Century. I’ll keep posting as I think of more and organise them more coherently once I think I’ve got a good solid list. Let me know in the comments if there are any glaring omissions! I mentioned in a previous post how art can serve the purpose of holding a mirror up to our consciousness so as to explore deeper truths. Similar to this I think, Rob wants me to explore further outside of my music as way of discovering more about what is true for my composing practices, which is to say, by understanding my tastes and inclinations more broadly I may see commonalities that reinforce what is genuinely important to me in my own music. So the purpose of these writings is to explore the “Who Am I?” question from a myriad of different place, triangulate, and see if I’ve actually been living on Mars all these years without realising it. No discussion of this nature would be complete without at least mentioning my musical influences My musical loves are fairly eclectic. Art-music-wise this ranges from Rachmaninoff to Ravel to Berio. [I’ll be make a list of my favourite works in an up coming post.] But I also love Jazz, and regularly find myself on the hunt for new videos of James Morrison (the trumpet one, not the singer). What is true about all my music is that it tends to be acoustic and generally involves live performance by humans which allows for human connection and communication. I tend to have a preference for music that allows for spontaneity. I don’t think I tend to appreciate much music that is reliably the same. I would rather listen to two different orchestras play the same symphony than listen to the same recording twice. All of this allows for more opportunity for self-examination, something that particular musical forms, like main-stream or popular music, tends (I feel) not to. That music, for me, seems largely to be about how amazing and famous the artist is, more than the music’s potential for seeing internal truths. Popular music seems to be quite externally focused, even though the themes are often internal phenomenons like ‘love’ etc. However, that all tells you more about what music I like to listen to, but less about the music I write, which isn’t necessarily even similar. When imploring me to undertake such a quest of self-analysis and exploration, my supervisor (Robert Davidson) mentioned that, for example, if you ask Steve Reich who his major influences are he can quite specifically list “Bach, Stravinsky, and jazz” as the major ones. I found that interesting because I LOVE a lot of different music, from the swoon-worthy Rachmaninoff to the cheeky and clever Prokofiev, to the complex simplicity of Ligeti, but also Stravinsky, Syzmanowski, Ravel, Debussy, etc they’re all great, so how can one easily point to three major influences? It somewhat baffled me, as if you ask me that question a month later I’m still not going to be able to give you a straight answer. The composers whose music I can see the most commonality with in my own music are probably that of Debussy & Ravel, perhaps my music seems more Debussy-esque and lacks the extreme refinement of Ravel’s. However, I recall my biggest compositional influence pre-conservatory were probably Bach, Beethoven, Stravinsky & Michael Gandolfi, the latter whose works I discovered somewhat accidentally and really enjoyed at the time. (And still do, although it’s been a while since I listened to any of them). Since then however, I’ve been exposed to such a wide variety of musical styles and works and ideas that it’s all vaguely overwhelming. Stravinsky could possibly stay on the list, but then again, maybe not. Part of me worries if it’s bad that my music is probably most closely aligned with composers who died around 70 years ago? I do feel an external pressure to be ‘modern’ and to ‘keep up with the times’, but as I discussed in Who Am I – Part I the composing experiences for me is deeply related to exploring what arises spontaneously in the space, not in concocting a new form of music like a mad scientist playing with sound. That actually sounds pretty fun when described thus… Plus, you’d get to yell “IT’S ALIVEEEE” at 3am in the morning as your Frankenmusic comes to life. Sadly, as much as the image of a mad scientist/composer is a fun one, and as much as I’d like to be good at everything, I can only look to the place my music arises from and be faithful to it. If it happens to share an affinity with other composers’ music, that is simply a happy co-incidence. After all, I love Rachmaninoff’s music and have listened to at least as much Ravel, but that is not the music I hear when I sit to write, which suggests that the relationship is much more complex than one of exposure and imitation. This is true too when I write fiction on occasion – I love Terry Pratchett but what I write has little relationship to his writing style, even though he is one of the few authors whose books I have read more than once. So it is not so simple as what goes in is what comes out. So what are my musical influences? I don’t know. I can’t point to Three Major Influences. It’s as though someone asked “who had the biggest influence on your personality?” My answer to which is ‘stuffed if I know’, and when I try and consider it seriously I have the same problem; 100 possible influences, but which ones are still relevant or are the major ones I’d not be able to determine with any surety. Alas, I shall keep trying. In mean time, I’ll be putting together a list of my favourite works from the past century. PhD – Yay! ; Poluenc – Yay! ; Composing Techniques – meh! As of last week, I am officially a PhD student at the University of Queensland, studying – you guessed it – Composition! I’m incredibly excited to be embarking on a new chapter of my musical journey. I am, of course, somewhat terrified as well. I can do the music part, and I know I am capable of writing semi-coherent words in more-or-less the correct order and with more-or-less the correct spelling, but what my topic is going to be, I have ideas, but nothing set in stone. After meeting up with my supervisor and composer-extraordinaire, Robert Davidson, he stressed that the research should be practice-based, not practice-led, meaning that everything has to tie directly into the musical practice, and not use the music to answer a secondary question. I admit the latter was what my PhD application focused on, so I’ve had to throw that away more or less. I was originally going to look at the role of intuition in the composing process which is, I think, a fascinating thing, but is definitely using the composing to answer a secondary question. While I have a significant amount of time between now Confirmation (A bit under a year), the difficulty for me is going to be working out what the heck to write about? (4) that inspiration is such a mysterious thing that it is better not to attempt to explain it. Of course, Poulenc avoided a conservatoire education and learned privately, but his music is inventive, playful and free-spirited. I can also relate a lot to his sentiments and have long felt somewhat of a repulsion from conventional forms like “Sonata form” which seem dishonest in someway. So it was interesting to see similar inclinations from a wonderful composer about intuition/instinct as the driving musical force. I have always struggled with relying on my instinct, which is perhaps why I was so interested in exploring it in my PhD. It’s not because I don’t have a musical instinct to trust, but because I’ve never been totally sure of its trustworthiness. Is it enough to just go with that intuition? I’ve never managed to get a clear answer. My musical ‘education’ has always been a subtle pressure in the opposite direction. Much of what I have learned has been ideas about composing techniques. I remember that one of the first composing books I read was Schoenberg’s “The Art of Musical Composition”. What does the book teach? Composing techniques. How to build melodies from motives, how to spin material out into longer works, how to structure music in particular forms etc. 1. One is the intuitive, natural outpouring of music which happens on its own without any real effort beyond working out what it is you’re hearing. 2. The other is that the technique based approach of music composition. Many will argue that both are important. That a ‘Marriage of Craft and Intuition’ makes for good music, which is no doubt true, but I suspect only when the craft is serving the music, and not responsible for it. Most composers must turn to no. 1 at least in the beginning so that they can uncover the material from which the piece will grow, but from there, it is easy enough to switch to no. 2 and use techniques to spin out the music. Let me give you an idea of how this might work. I’ve also indicated when musical intuition was involved in the process by underlining the description of the thing. Below is a series of isolated chords (they are not intended to flow) which I have cooked up and possess what I would consider and ‘intriguing’ and somewhat ‘mysterious’ quality. 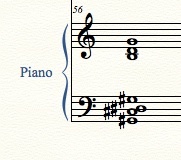 The third chord is a bit of a rogue in that it is very sonically different that the others. It’s only a quick sketch and it needs some tweaking, but I do really like this resolution actually, although it is very final. What I like is the way it very gently grows ‘still’ and harmonious. To me, it almost sounds like the end of a long Mahler symphony, finally arriving at D Major after a long and troubling journey. So I’ve just tweaked it slightly more now, to make it an even longer and more meaningful return to ‘home’. Ahhhh… Isn’t that beautiful? Imagine it played with some strings and horns and a very gentle timpani roll on the last chord. And as so often happens, all of it grew out of one chord that suggested a string of resolutions. As it’s much too final to use anywhere in the beginning of a work, I’m going to put is aside for now and come back to it later, perhaps at the very end of a movement. I can hang onto the originating chord though and use that throughout so that there is a sense of continuity when we do arrive at the end. I’ve heard this repeated accelerandi technique quite a number of times before, but couldn’t name a specific piece. I say it’s takemitsu-esque, but that’s because it evokes for me an image of rain dripping in a forest, which is an imagery I also strongly associate with Takemitsu. The effect is one of stillness and motion. 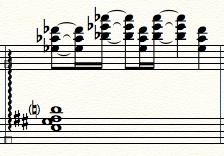 You’ll notice that the second of the chords appears in the second last measure, so some connection between these ‘chord worlds’ is emerging. I’m going to leave this as it is and for now, I’ll move on to seeing what the second chord suggests to me. Played as a block chord, this one has a very gentle, slightly bittersweet quality, and the sus 2 of the upper chord gives it a decidedly ‘pop ballad’ quality, and that is really all it implies for me, a sort of pop ballad. I don’t really find it wants to take me anywhere in particular (Trust me, I tried but it doesn’t lead anywhere interesting for me) so I’m going to leave this as it is… at least for now. The trill idea is rather Ravel scarbo-esque. So now, I’m going to work with each of these figures to see where they lead. 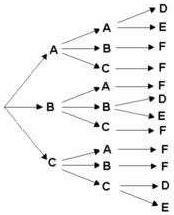 The process here is a kind of probability tree or similar, where each new event creates several new possibilities which in turn creates several further new possibilities and so forth. The question to ask here, as a past teacher of mine would often ask of me, is what are the possibilities? What can be done with this musical idea. These are points of departure and it’s a process that some composers find helpful in getting the ball rolling. 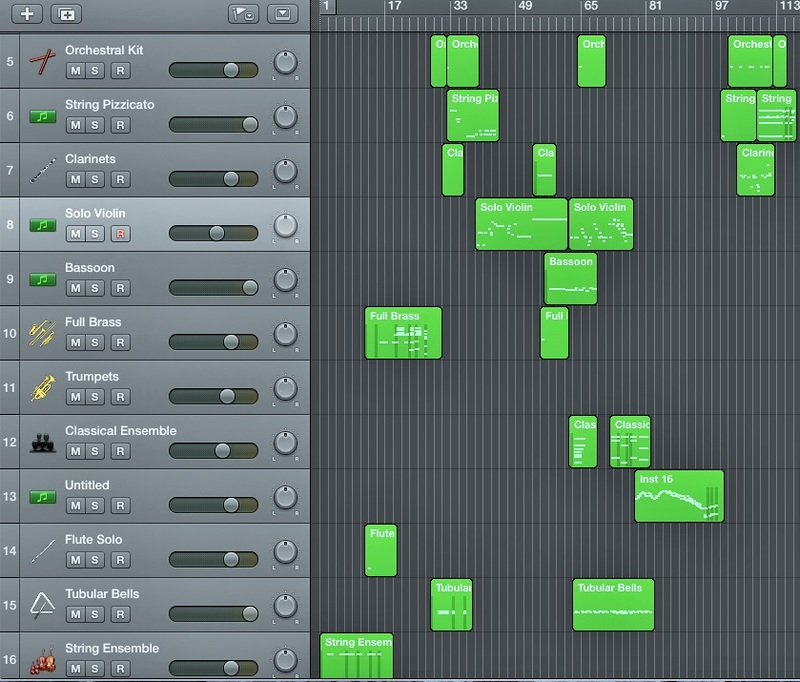 Note: I change the final chord to make it more sonically interesting. 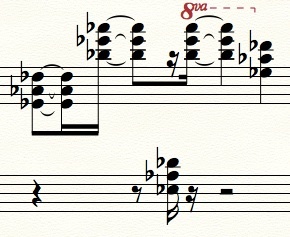 Note: Here I’ve taken only the first half of the motif and repeated it down a tritone. It could also be moved similarly in any sequence of intervals… Diatonic or chromatic etc. From this point, the process becomes entirely more complicated. As with every variation you produce a further subset of possible variations etc. While this sort of variation-by-technique approach may surprise some, it is more or less exactly what the two more widely known composing books – written by Schoenberg and Hindemith – describe, plus some other material on structure and counterpoint and so forth. It is a process that can turn a very small amount of material into an enormous amount of material. And it is what music theory teachers talk about as “Motivic Development”. The classic example is Beethoven’s 5th Symphony. You know the one… Da-da-da-dumm. et cetera. It’s also very much a part of the much-loved works of Bach, who was the master of invention and permutation, and was using Retrograde-Inversion long before Schoenberg was born. I openly admit to having used a similar strategy in several pieces (Never for an entire work mind you, normal just here and there). I also admit that those pieces are emphatically not my best works. For me, if I reflect on this process, there are several real, significant problems. 1. As soon as I do it, I’m disconnected. When I sit down and start writing, there is a flow, a thread, a sense of gradually following an unravelling idea or string of ideas from start to end. However, as soon as I turn to technique, there is an abrupt sense of disconnect. The thread is broken, and for some unknown reason, it’s hard to pick it up again. 3. Composing becomes way, way, way less enjoyable and satisfying. Composing can be a really wonderful and exciting experience of going on a musical journey with your imagination, and that is what makes me want to compose! The joy and satisfaction and excitement of find the perfect next note or chord etc is what makes it fun for me. 4. It all becomes rather arbitrary. None of the material seems ‘special’ any more. It’s just ‘organised sound’ and your job as a composer becomes arbitrary. You’re a facilitator, not a creator. It’s important to note here that this is definitely only my experience and my opinion! I’m not suggesting that this is wrong or unethical, simply that if I’m honest, it really kills the creative experience for me. It may also be interesting to note here that there is a similar divide between other creative artists. Authors, for example, often talk about being either a “Pantser” or a “Plotter”. The former, including authors like Stephen King, Patrick Rothfuss and the late Sir Terry Pratchett, wrote by setting the story in motion with characters and a general idea or situation, and letting things play out. Plotters on the other hand, which includes authors like Brandon Sanderson and Russel Kirkpatrick, will spend a lot of time before they start writing working out what the story is about, where it’s going, the climax and how it will end. Neither is right or wrong, and both supposedly have pros and cons. People in either camp will likely argue in favour of their approach, some times with valid points, such as ‘plotting’ allows for more complex stories, where as ‘flying by the seat of your pants’ (aka Pantsers) may have more natural characters and a more natural flow of events. Personally, I think it likely is down to the temperament of the author (and composer) as to which works. I know from having written about 100, 000 words of fiction here and there, that I am just not a plotter. Try as I might, it doesn’t seem to work. Interestingly, when I try plotting I experience the same sense of “disconnect” as when I try to compose with techniques. It seems that for me, the process of composing is the process of finding and connect the dots as I go. It’s like a “connect the dots” except that you can’t see the next dot until the previous dots have been connected. That said, normally part way through, you start to have an idea what the big picture looks like. A downside of composing this way is that such composers are often criticised for the structure of their works. This was often a criticism Poulenc received of his works, but I think perhaps that can be a good thing. After all, if you read stories that consistently use the same structure, you can start to predict how it will turn out, which can ruin the experience. Although, where TVs and Movies are concerned many people actively don’t allow themselves to make that observation for that very reason. It’s why those people who can tell you ‘who dun it’ 5 minutes into that murder-mystery film are universally hated. But for those who really enjoy a particular genre of something, beyond it being simple easy-entertainment, such narrative structures start to become impossible not to notice. I remember seeing a meme floating around facebook for a while about Cop shows where it points out that the guest actor is pretty much always either the victim or the culprit. If you have noticed that, it kinda ruins the experience a bit. I think the same is true for music, and why less rigidly controlled and structured music, like that of Poulenc, is wonderful. You don’t know what to expect, and that can make the music a wonderful and unpredictable journey. I personally like that. That said, there is still coherence to Poulenc’s music, it’s simply not a predictable coherence. 1. YAY, I’m doing a PhD in Composing! 2. Poluenc was an interesting composer. 3. I don’t think a technique-focus when composing is helpful for me. 4. There are pantsers and there are plotters. Which works is probably down to individual temperament.